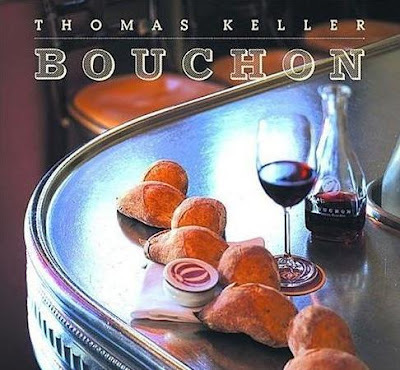 Still stuck in Bouchon as I started this weekend. I'm having a couple friends over for French Onion Soup and Steak Frites next weekend (All of that Steak Frites experimentation was practice for them...), and I certainly wasn't going to use store-bought beef stock for Thomas Keller's French Onion Soup. I don't mind using boxed broth for assorted strongly-flavored soups where the broth isn't the star, but I always like to make my own for dishes that can easily be taken to the next level with homemade. My stock-making experience was solely in the chicken genre before this weekend, so this was an interesting learning experience as well. This started with a trip to Blood Farm, where I managed to snag their last 6 pounds of soup bones (which are only 89 cents/pound!). While the bones are roasting, half an onion is placed into a pan over high-ish heat to char. while the pan is deglazed with a little water. I started all this on Saturday, and it was around 5pm when I got to this point... which seemed like a bad time to start a 7-hour process, so I threw the already-cold pot in the fridge and picked up from this point the next morning after a good night's sleep. After bringing the water to a simmer over medium heat, the bones gently simmer for 5 hours as you skim semi-frequently to remove impurities. Finally, there you have it: 3.5 quarts of absolutely gorgeous beef stock... for use in next weekend's awesome soup. This was really simple, despite the number of hours required. It smelled amazing even when it was just the bones and onions simmering away for hours, and got even better at the end. Can't wait to make my soup.